The Peterborough Lapidary is a late fifteenth-century treatise in Middle English on the occult properties of stones and minerals that was preserved for centuries in the library of Peterborough Cathedral (and possibly Peterborough Abbey before that) and is now deposited at Cambridge University Library. Lapidaries were a popular literary form in medieval England but the Peterborough Lapidary stands apart from the others on account of its length; whereas most lapidaries were brief pamphlets, the Peterborough example is an attempt at a complete A-Z account of stones and minerals, both real and mythical. The Peterborough Lapidary, as the most comprehensive example of the genre, is therefore an important point of access to medieval English thought on magical stones. 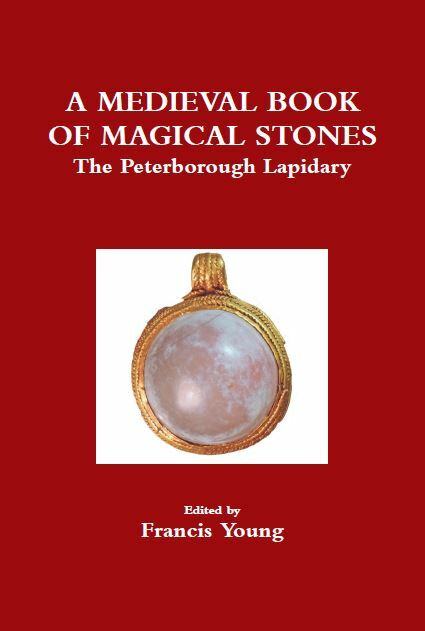 My new edition and translation of the Peterborough Lapidary, entitled A Medieval Book of Magical Stones, is the first new edition since 1933, and the first to supply a translation of the text into modern English. A great deal of research on the lapidary tradition has been undertaken since Mary Evans and Joan Sergeantson first published the text of the Peterborough Lapidary for the Early English Texts Society, and the new edition has a thorough introduction that sets the Peterborough Lapidary within the context of that scholarship, as well as the lapidary tradition and medieval magic, science and medicine. There is no direct evidence to demonstrate that the Peterborough Lapidary was present in Peterborough before 1708, but circumstantial clues point to the possibility that it could have been compiled or acquired by a monk of Peterborough before the dissolution. Lapidaries existed in other monastic libraries and the Peterborough Lapidary shared a common source with another lapidary produced in Northamptonshire, of which Peterborough was then considered a part. The fact that the Peterborough Lapidary is bound together with medical works suggests that it may have been obtained by a late medieval infirmarian of the Abbey and then survived the dissolution and subsequent sacking of the Abbey by Parliamentarian troops because it was a workaday manuscript of unspectacular appearance that did not attract attention. For many years scholarship on medieval English lapidaries has been primarily philological (focussed on their linguistic features as Middle English literature) and preoccupied with source criticism, while neglecting questions about who used lapidaries and how, and how the lapidary tradition related to other forms of magical, medical and ‘scientific’ literature. Although my edition may well be helpful to students of English literature it is also aimed at students of the history of science, the history of medicine and intellectual history – hence the addition of a translation of the text into modern English. I am hopeful that the edition will stimulate further interest in lapidaries from historians of magic in particular, since these treatises belonged to the category of apparently innocuous medieval literature that in reality concealed highly subversive beliefs and practices. This entry was posted on October 13, 2016 by jacobite.